The Holy Injil is accepted as a revealed Book in both Christianity and Islam. 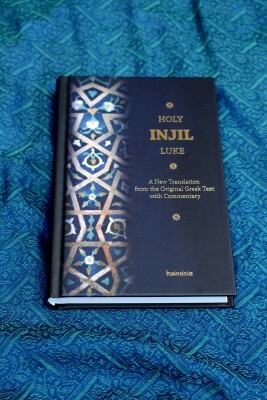 This is a new translation from the original Greek of ‘Luke’, the longest book within the Injil. Luke contains a full account of the life and teaching of ‘Īsā al-Masīh (his peace be upon us), from the angelic announcement of his birth to his ascension into heaven. The translation is into English and uses names and terms that are more familiar to Muslims. The commentary provides background information, seeks to explain difficult words and concepts and relates the material in the text to other parts of the Injīl and also to the Taurāt, the Zabūr, the Books of the Prophets and the Qur’an. New Revised Edition now available! If you would like to purchase a copy/copies of the book, please fill in the form below. Please tell us in the "Message" box how many copies you would like to order, and also your postal address, and we will get in touch with you. If you have any questions about the Injīl and its message, please send these via the form below, and we will get in touch with you.